Mixing elements of alternative rock, indie jangle and a just a touch of dream pop, Australian rock band Evoletah create sounds for people who like their rock music with a nineties vibe. One of the first things notable about ‘Sleepwalker’ – the band’s third full length – is that the album’s live in the studio sound really favours the drums. Even at times when the rest of the instruments are allotted an equal space in the overall mix, those drums still have the edge. An indie rock approach to the guitar riffs often gives the band a centre-point from which to spiral out, but perhaps the strongest element of Evolateh’s sound is frontman Matt Cahill’s vocals. The ex-Violets vocalist has a laid-back approach which sometimes hints at a fellow Aussie, The Church’s Steve Kilbey. Released as the album’s first single ‘Cain & Abel’ is a mid paced tune. Throughout the verses, the guitars don’t break from their initial jangle, leading the listener to think that by the time the chorus rocks up, everything will reach a peak in a suitable blaze of glory. While this is certainly true of the drums, nothing else really changes tack. In this respect, the track is best described as vocal led, since it’s only frontman Matt Cahill’s voice doing anything really interesting. ‘Shortly After Takeoff’ is a professionally constructed slab of indie rock which builds tension during its first half, and then gives way to a rousing performance from Jason Eyers-White, while ‘The Hurting’ has a jangling, marching base, over which Cahill delivers an emotive performance. Despite best intentions, the lack of obvious hook means the audience has to be totally into Evoletah’s sound almost from the get go, since there’s not always much else (hooks, mainly) to help win anyone over. ‘Invisible’ has a cool vibe, as the band adopt a waltzing time signature, topped with more solid jangling. These elements don’t necessary hold the interest alone, but a brief trumpet solo along the way adds something extra. …And while the band are more than musically competent, this highlights that it’s that little “something extra” so many of ‘Sleepwalker’s tunes often miss. Much better, the lack of drums during ‘Northern Gentleman’ allows a brief glimpse into something more intimate. Andrew Boyce lays down a noodly guitar line which blends elements of pop rock with a touch of seventies prog, while occasional cello is on hand to add colour. ‘Minutes Into Years’ is perhaps the album’s finest moment; a track of two distinct halves, the first takes a similar approach to the majority of Evoletah’s best songs, allowing Boyce to work a dreamy, clean-toned riff, over which, the vocals are wistful and breathy. Occasionally, as the notes drift from the speakers, ‘Minutes’ has the majesty of a tune which could have been recorded by the aforementioned Church during their ‘Priest=Aura’/’Sometime Anywhere’ days. For the second part, things really rock up, as the guitars crank out some distorted electric riffs to bring things to a climax. Like ‘Invisible’, this number proves that despite their often middling outcomes, Evoletah are a band with a lot of potential. Aside from ‘Northern Gentleman’, almost everything is of a mid pace, which after a while makes things start to blur. 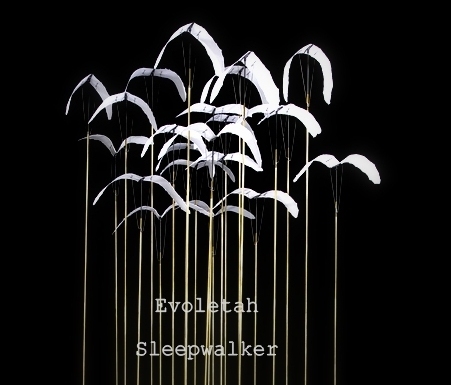 Although this release has a good end sound – giving some indication of how the Australian four piece possibly sound like in a live setting – and Evoletah are clearly quite talented, ‘Sleepwalker’ would have definitely benefitted from a change in pace once in a while. As it is, though, you’ll find a few enjoyable tunes buried within, and picking up a download of ‘Minutes Into Years’ should definitely be on your “to do” list. This entry was posted in alternative, aussie by Real Gone. Bookmark the permalink.